Even before Kā‘anapali Beach on the Hawaiian island of Maui was named America’s Best Beach by glossy magazines and social networks alike, I knew it. I had a deeply felt persuasion which required no further justification than what met the eye: a three miles long golden sand beach, kissed by the gently splashing turquoise waves, framed with palm trees, fragrant plumerias, and flowering shrubs, and split in the middle by the notorious Pu‘u Keka‘a (Black Rock). The westernmost point on Maui, the Black Rock is a place for a nightly sunset cliff diving ceremony in honor of a legendary chief, and also a beginner-friendly snorkeling spot teeming with colorful tropical fish right by the shore. In addition to providing endless opportunities for swimming, surfboarding, pedal boarding, diving and boating, the beach serves as a starting point for all kinds of cruises and water excursions, and is only steps away from the big hotels, luxury condominiums, farm-to-table restaurants, shopping centers, and watersport equipment rentals. 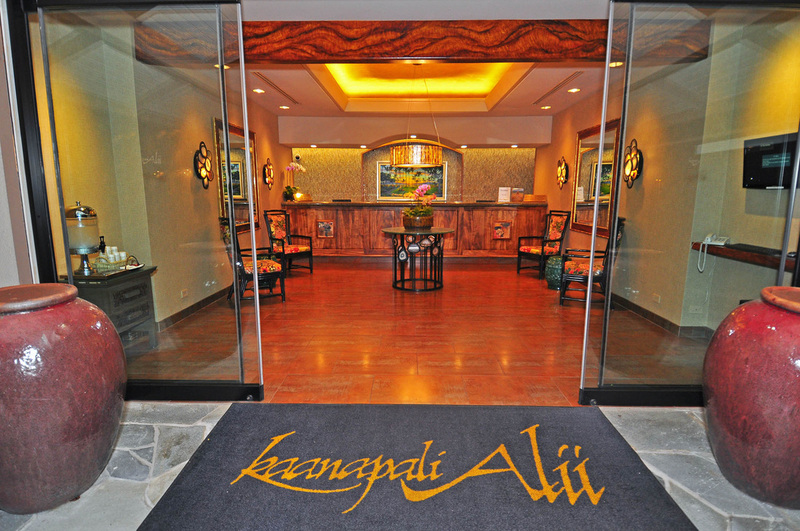 All of the above constitutes Kā‘anapali Beach Resort – a place of eternal sunshine, dreamlike natural beauty, and comfortable vacations. After a pleasant flight with Alaska Airlines that included mai tai cocktails and Aloha greetings, my husband and I picked up our red Ford Focus at Budget Rent-A-Car, thinking we would be driving around a lot. Turned out, everything we wished for was right there at the Kā‘anapali Beach, even a free ride from one place to another on a vintage Kā‘anapali Trolley. Our rental condominium in Kā‘anapali Alii, a luxurious beachfront complex managed by Classic Resorts, Ltd., had a spacious living room which opened to a private lanai overlooking the ocean; a full kitchen with a marble counter/breakfast bar; a cool and quiet master bedroom, a spare bedroom, and a little laundry room in addition to two bathrooms and a mirrored hallway. 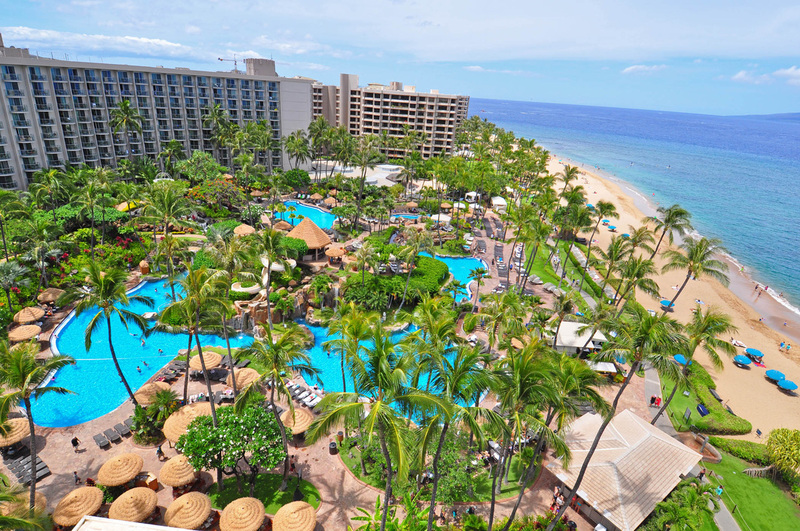 Founded in 1984, the “condo-hotel” Kā‘anapali Alii has 264 units in four buildings grouped around a cluster of nicely designed swimming pools, manicured lawns, and alleyways, lined with palm trees and flower beds. In a front desk facility there is always a live person on duty 24/7, answering all kinds of requests, as well as valet service, in addition to many other services that make staying here so utterly care-free. All units at the condo-hotel have owners who come to vacation here sometimes, and rent them out for the rest of year. Each unit has to adhere to high hospitality standards; however, the individual unit’s décor is up to an owner’s taste. In “our” condo, the walls were adorned with tasteful pieces of local craft, paintings, and art photography depicting the flora and fauna of Hawai’i. One invaluable service offered by the condo-hotel is home delivery of grocery packages. Soon after we’ve settled in our wonderful vacation rental and checked out all the large screen TV sets in every room, and all the various and numerous gourmet cooking utensils inside kitchen cabinets, a doorbell announced the arrival of our breakfast package (eggs, milk, butter, yogurt, English muffins, coffee, cereal) and our grilling package (fresh tuna filet, zucchini, corn on the cob, plus green salad, lemon, salt and pepper). In time for sunset, we were outside, meeting and greeting other condominium guests at the oceanfront Sunset Grilling area with industrial BBQ grills and tables and chairs under a large tent. 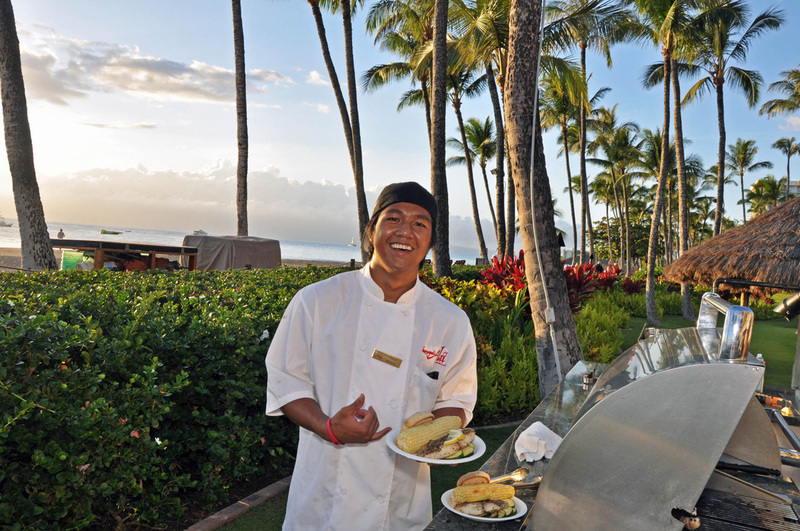 Kā‘anapali Alii is the only place that offers a grilling service provided by a professional grill master – one of the staff employees. The service eliminates any possibility of accidents from those who don’t know how to operate the grill as well as unnecessary waiting, and allows people to spend time just relaxing by the ocean and chatting away while their fish, chicken or pork is being masterfully grilled and even seasoned to perfection. Needless to say, with grocery delivery, full kitchen, and Sunset Grilling, families save a bunch on eating out, and tend to return to this place for at least a week year after year. 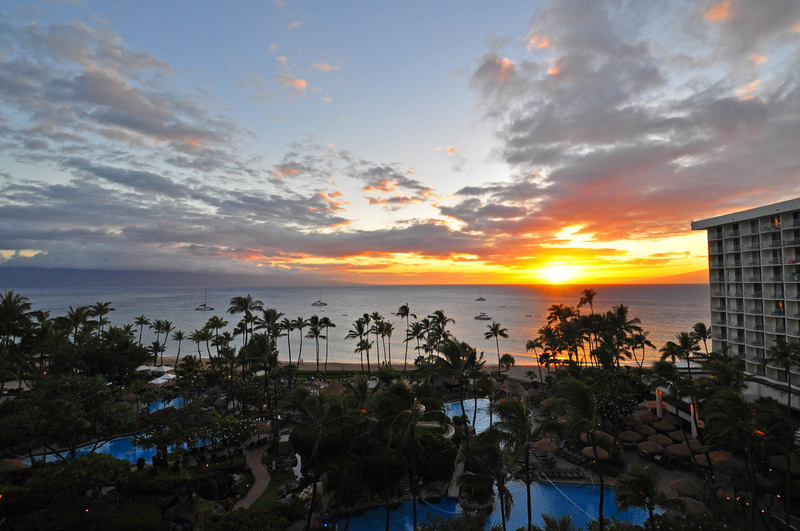 For romantic couples who prefer to eat out and spend their leisure afternoons among the lush gardens, pools and waterfalls, and to attend a lu’au or a nightly torch-lighting ceremony, The Westin Maui Resort & Spa offers a desired retreat. Serene and stunningly beautiful 12-acre resort with 731 rooms and 28 suites is filled with exquisite antique artwork and exotic wildlife. A flock of pink flamingoes and a family of giant colorful koi reside in a pool by a waterfall, practically in the open lobby they share with the resident parrots. Palm groves, green lawns and cascading waterfalls frame the five pools of the aquatic playground. Recognized as one of the Top Ten Amazing Pools worldwide by TripAdvisor, the 87,000 square-foot pool area includes an adult-only pool deck, a Jacuzzi, two water slides, a swim-through grotto and a hidden whirlpool. A white wedding gazebo is located on the top of a slight hill in front of the lobby, amid tropical greenery and ever-blossoming flowers. In-room features designed to provide blissful comforts include restful Westin’s Heavenly Bed, Heavenly Bath with oversized shower heads, in-room high speed Internet access, and pet-friendly program. At the newly-refreshed Aloha Pavilion a lavish presentation of Wailele Polynesian Luau attracts about 500 guests every night. An excellent musical revue with a popular MC features songs, dances, and elaborate costumes of the indigenous peoples of Hawai’i, Fiji, Samoa, Tonga, Tahiti, and New Zealand. The show closes with a grand finale of an incredibly beautiful fire dance, unique to the island of Maui. 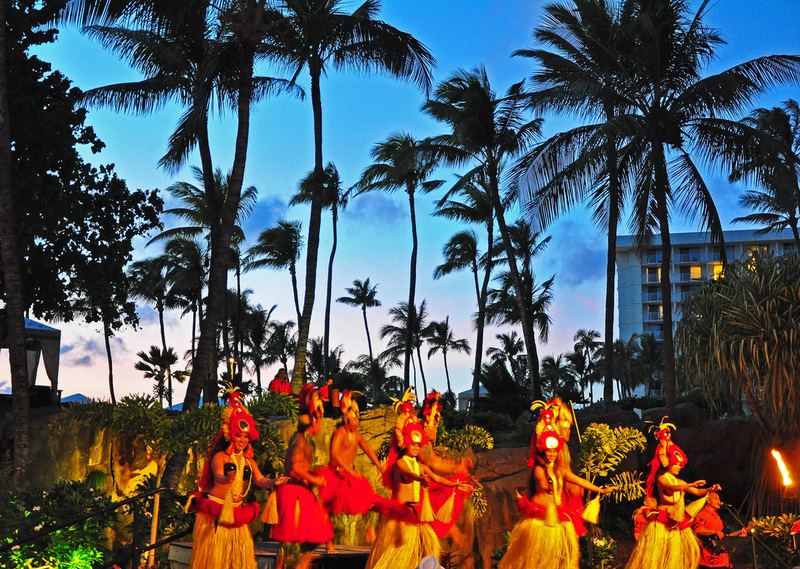 The show is accompanied by a multi-course dinner of Hawaiian specialties – kalua pork, taro-leaf wrapped chicken, lomi-lomi salmon, purple sweet potato, various sides and salads, and tropical cocktails and desserts. Kā‘anapali Beach Resort includes 12 hotels and luxury condominiums, 31 restaurant, 7 spas, 4 lu’au presentations, and dozens of stores and shops in 5 shopping malls – Fairway Shops at Kā‘anapali; Whalers Village Shopping Center; Shops at Westin Maui; The Shops at the Hyatt; Royal Trading Co.
More information at: http://www.kaanapaliresort.com, http://www.classicresorts.com, http://www.westinkaanapali.com.